This past month we’ve had two dances pop up with ensembles that are not regular dance bands – Chapel Hill High School’s and Duke University’s respective jazz ensembles. They had, in my mind, potential to overcome some of the problems some local adult big bands face, like the fact that some of these kids are picking up these instruments every day and playing 5 days a week in an ensemble setting might give them an edge. Also, how would the high school kids stack up against the college kids? I’d heard some good things about the Chapel Hill High School’s jazz program, but then Duke kids are probably some of the most gifted students in the nation. The first dance was Chapel Hill High School’s swing dance on March 8, held in the high school gymnasium, but not without substantial pomp and decorations. This year was the 18th anniversary of the annual swing dance, which is a fundraiser for the band boosters that includes the dance and a silent auction of goods and services from local businesses. The gymnasium was packed with teenagers, mostly standing around or solo dancing in groups, but some were actually partner dancing. Parents and adults had a seated area near the stage. 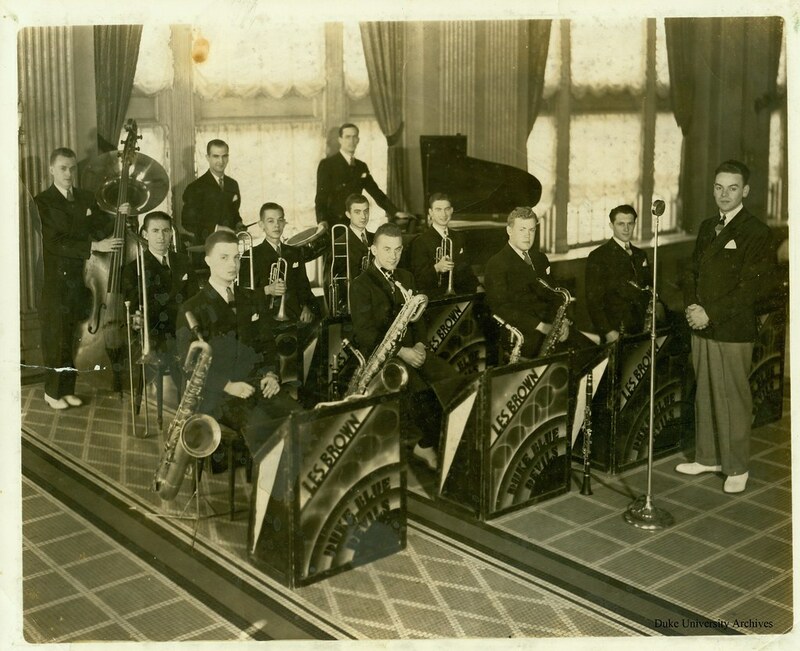 A large stage was set up with risers for the band, which was necessary since the band was a giant big band – something like 8 or 9 trumpets, as many trombones, even more saxes, plus students trading off spots in the rhythm section. That piano intro is like a call to arms, a trigger for a jam circle! The dance itself was quite a show – the band director kept things moving with announcements, introduction of the numerous (I counted at least 6) guest vocalists, and promotions for the fundraiser and silent auction, leaping into the next musical number as soon as he was finished speaking. The song selection was a mix of classic swinging tunes (Jumpin’ at the Woodside and Leap Frog were highlights), songbirds and crooners on slower dance tunes, some 50’s/60’s Sinatra, a token neo-swing song (vocals performed with gusto, I might add – I had to smile), and a smattering of ballroom fare. Overall, the tempos were up and most of the songs kept us moving. The kids in the crowd cheered for their friends when they were featured and the vibe in the room was extremely positive and supportive. When the band took a break, a student combo played the breaks. The first band break was a little more swinging than the second and that was their only big misstep, having a group play more modern feeling tunes that lacked the drive to be danceable during that second break. In spite of being outnumbered 50 to 1 by high school students and feeling only slightly awkward being the only dancing adults in the room, our group had a pretty good time. What the high school kids lacked in skill they made up for in enthusiasm and spectacle. I hope more members of the swing dance community decide to come out to this dance next year, both to support these burgeoning jazz and swing musicians and as a great opportunity for outreach to all these high school kids who were dancing and enjoying themselves. If only they knew they could do this every weekend! The dance floor at Duke Gardens is amazing! The second dance was at Duke Gardens on March 27 and was a collaboration amongst Duke Gardens, Jazz@ Duke, the Duke Swing Dance Club, and the Duke Jazz Ensemble. Duke Gardens has played host to a number of DJ’d swing dances over the past few years and is arguably one of the swing dance community’s loveliest venues. This dance was not only free to all who attended, but also had an impressive buffet set up on the patio for the dancers to partake. The Duke Swing Dance Club did a great job with promoting the dance and teaching the beginner lesson before the dance. This is the second year the Duke Jazz Ensemble has performed in collaboration with the Duke Swing Dance Club, although the location of the dance was different from last year. – The students were older, had probably played their instruments longer, and I knew that gaps in the ensemble were often filled by more skilled community players. – In the 1930’s Duke University was host to several dance bands and orchestras, including Les Brown and his Blue Devils from 1933-1936, before Les Brown went on to start his Band of Renown. Under the direction of Les Brown, the Blue Devils made some hot recordings and went on several regional tours. Check out this fantastic recording of the Blue Devils performing “Rigamarole.” Arrangements from Les Brown’s time at Duke and from later years reside in the Les Brown Scores Collection at Duke University Libraries – I am salivating over this collection! – I have on good authority that there are other swing era charts (as opposed to post-WWII arrangements of swing era songs) in Duke’s music library, per a former Duke student who performed in the jazz ensemble. – In the Facebook event the Jazz@ promoter posted that the band would be performing “swing-style Jazz from periods before, during, and after the 30’s.” I’ve only heard one other Triangle-based big band perform a 1920’s piece, which was the North Carolina Jazz Repertory Orchestra, a band made up of professional musicians and college professors from around the state. The Facebook event also had 180+ RSVPs, which meant lots of people and potential energy. So with all of these things in mind I was fairly confident that the Duke Jazz Ensemble would deliver a dance that at least had some variance in song selection, perhaps some lesser known tunes with hot arrangements. Musicianship-wise, they had an edge on the high school students because the students did take solos, but most of the solos were done by the excellent Brian Miller, a local professional, whose solos were definitely a highlight of the dance and who appeared to carry the band at times. However, the Duke band lacked the presentation, showmanship, and energy that the high school event excelled at executing. The Duke ensemble had no vocalists, though they played many of the same vocal tunes as the high school band, just as instrumental arrangements. The guitar player slouched in his chair and plucked single notes on his hard body guitar, instead of laying down the essential rhythmic chunk-chunk-chunk-chunk of quarter note chords that completes a swing rhythm section. Most of the tempos were around 150 bpm and songs ran well over 5 minutes – in several instances there were 8 minute songs, which can be purgatory for a newer dancer who may only know a few moves. There were a few really slow tunes and some faster tunes, but the band seemed to fall apart toward the end of the faster tunes, which were around 180-190 bpm. Toward the end of the night they played a combo tune while the rest of the big band just sat there – if you have a big band, use it! We can hear small groups any time. There were also no 1920’s tunes, as were promised, and, arguably, no 1930’s tunes – the repertoire was 1940’s-1960’s and the drummer never left the ride cymbal except to play fills. One of the songs the band performed was an arrangement almost identical to Count Basie’s “April in Paris,” a song that was recorded in 1955 or 1956 and released in 1957 on an album of the same title. This particular recording is quintessentially new-testament Basie and any swing DJ worth his/her salt will know this tune. A local dancer/DJ was dancing in front of the band when they performed this tune and at the end, after they hit the big sustained note as an ensemble, she yelled to the band, “One more once!” No one cracked a smile and they stared blankly at her. She addressed them again, “One more time!” More blank stares, no shout chorus. Brian Miller was the only one within earshot who acknowledged that she was referencing the recording and told her that the band did not have that version of the arrangement. I don’t know if this means that the rest of the band had not checked out the recording of the song they just played or if they were being obtuse, but it did not sit well. I’m going to declare the Chapel Hill High School Jazz Ensemble the winner of this battle – while the Duke Jazz Ensemble played a post-WWII repertoire with the addition of improvised solos, the Chapel Hill students captured the energy and feel of the swing era and songs of later eras, as well as considering the needs of dancers in terms of song length, rhythm section, and creating a connection to the audience through the bandleader and vocalists.